Figure 1: A view of the web controlled rover. Instructables user jscottb has built a web-controlled rover and shown it off to the world on his build page. The rover is built around an Actobotics Gooseneck chassis which uses a pair of 195 rpm planetary gearmotors for propulsion. The pair of motors is controlled by a RoboClaw 2x5A motor controller used in simple serial mode. The brain of the rover is a Raspberry Pi B that both talks to the RoboClaw and hosts a webpage used to control the rover. 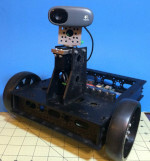 The webpage hosted on the Raspberry Pi is accessible by any device that has a web browser and features a large number of graphical controls to drive the rover and operate the webcam who's video feed is visible on the same page. The Python-based framework Flask was used to build the page. We thank jscottb for sharing his project and for taking the time to document it so well. The rest of his robotics projects can be seen here.